Edited by Rev. Stan Perea with contributions from Dr. Stephen Bevans, Dr. Carlos F. Cardoza, Dr. Zaida Maldonado-Pérez, and Dr. Marcos Antonio Ramos, this book takes us through 50 years of Dr. Justo L. González’ ministry. 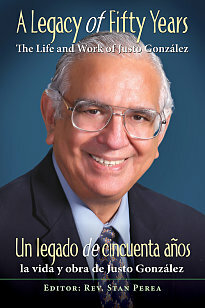 The book includes a reflection of Justo, his biography and the conferences of the First Lecture Series of The Justo González Center for Latino/a Ministries, held in 2012 under the general theme: "Justo: His Legacy to the Church." The book includes full text in both Spanish and English. Editado por el Rev. Stan Perea y con la participación del Dr. Stephen Bevans, el Dr. Carlos F. Cardoza, la Dra. Zaida Maldonado-Pérez y el Dr. Marcos Antonio Ramos, este libro nos resume cincuenta años de labor en el ministerio de Dr. Justo L. González. El libro incluye una reflexión de Justo, su biografía y todas las conferencias de la Primera Serie de Conferencias del Centro Justo L. González, la cual fue dedicada al legado de Justo a la iglesia Hispana/Latina y más allá de ella. El Libro está publicado en español e ingles. Highlighting the works of hispanic theologian Justo González, this book is the result of the First Lecture Series of The Justo González Center for Latino/a Ministries, held in 2012 under the general theme: "Justo: His Legacy to the Church." The Justo Center was established in 2011 by the Association for Hispanic Theological Education (AETH) as a centralized resource for Latino/a Ministries to address the need for accessible and affordable Latino-focused and Latino relevant resources.